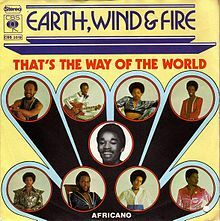 "That's the Way of the World" is a 1975 song by the R&B band Earth, Wind & Fire and is also the title track of their album That's the Way of the World. Written by Maurice White, Charles Stepney and Verdine White for Columbia Records, "That's the Way of the World" was released as a single in many countries and reached number 12 and number 5 on the US Pop and Black Singles charts. It ranks #329 on Rolling Stone's 500 Greatest Songs of All Time list. That's the Way of the World is a 1975 album by Earth, Wind & Fire released on Columbia Records. It was also the soundtrack for a 1975 motion picture of the same name which featured several of the band members in cameo roles. Included on the album was the single "Shining Star", which was a #1 U.S. pop and R&B hit. Another popular single was the title track, which reached #12 on the pop chart. The album spent three weeks atop the Billboard Pop Albums Charts, five nonconsecutive weeks atop the Soul Albums chart. Earth, Wind & Fire is an American R&B and funk band formed in Los Angeles, California, in 1969 by Verdine and Maurice White. Also known as EWF, the band has won six Grammy Awards and four American Music Awards. They have been inducted into both the Rock and Roll Hall of Fame and the Vocal Group Hall of Fame. Rolling Stone has described them as "innovative, precise yet sensual, calculated yet galvanizing" and has also declared that the band "changed the sound of black pop". In 1998, they were ranked at number 60 on VH1's list of the 100 Greatest Artists of Rock N' Roll. That's the Way of the World is a 1975 film produced and directed by Sig Shore, starring Harvey Keitel, and features the music of R&B/Funk group Earth, Wind and Fire (who also appear in the picture as a fictionalized version of themselves). The film depicts the music business and the life of record executives. A soundtrack by Earth, Wind and Fire released in the same year eventually became one of the famous landmark albums the group has ever made. What a lovely little trip down memory lane. Thanks!